"If the question was “did Taletale listen?” the answer offered by Abe Lincoln Must Die is “as much as they could". " Before Sam & Max: Episode 4 – Abe Lincoln Must Die was released, there was a lot of talk about Telltale listening to the feedback given by the gaming community. This was welcome as previous games have suffered from recycled concepts, limited lifespans and easy puzzles and it was these issues that promised to be addressed. Whereas said problems haven't been obliterated, they’ve certainly been regressed. Most of the previous complaints can be tied in to Telltale’s choice to release monthly episodes of their series, giving interested players a new case to crack while the next slice of sleuthing was readied for them, and it’s a choice that carries heavy pros and cons. There’s always going to be the recycling of concepts, of puzzles and gags. The street that houses Sam & Max’s office is always going to be used as a foundation block. Even though the people that live there have significantly differing aspect to them each chapter -- Sybil’s inability to stick to a single career choice and Bosco’s forever-changing paranoia-fuelled fake accent put on to try and fool ‘the man’ -- it’s a situation that finds itself wearing thin. These are valid problems and complaints. But none of them explain why I found myself laughing so hard at a chapter that has been lengthened from Episode 3, that has dialled up the difficulty on some of the puzzles and has done away completely with the more inane tasks featured in previous games like scrolling through ‘yo mama’ jokes or cycling through a set series of events while tapeing a sitcom over and over again until you get the sequence exactly right. Instead you need to go head-to-head with the president of America who has flipped his lid; ordering government-enforced group hugs before every sporting event, a witch-hunt for foreign stockpiles of forbidden pudding and new tighter gun laws. You’ll need to break into the White house, past top-notch secret agents and evade security long enough to get to the bottom of the continued slew of outrageous decisions. I mean, an America without lax firearms laws? Preposterous! You’ll even start your adventure at a new location for the first time in the series’ 4-month history when the duo’s battered DeSoto rams down the presidential mailbox outside the White house itself. As short-lived as it is (you’ll need to return to your office in short order to be able to solve the very first puzzle, in fact) it really does drive home the fact that Telltale have been listening. That’s not to say that they’ve managed to override a lot of all too familiar pitfalls. A lot of puzzles require constant pacing back and forth between two set locations, feeling very much like a cheap way to artificially extend the game’s lifespan. The cynical reviewer part of my persona saw red flashing warning signs as the drives between the office and the White house racked up alarmingly. But the delighted gamer in me reviled in the madcap conclusions that Abe Lincoln Must Die promises and delivers upon every single time. The strengths already running strong remain undiminished: voice acting remains awesome, continually flying in the face of those naysayers who doomed the series to a shallow grave when the original voices actors were not secured (Max’s original voice actor, Nick Jameson, is appearing in the awarding-winning TV show Lost, nowadays. Clearly his priorities are all screwed up!) But it’s the tight writing that drives the gamer on. The clever one-liners, the subtle mocking of the subject matter the chapter invests in (in this case, the ever-so-scary world of American politics) and the zany, outlandish situations the two always manage to find themselves in. Like get the slightly psychotic one to run for state. Then worry over how well he seems to fit in. If the question was “did Taletale listen?” the answer offered by Abe Lincoln Must Die is “as much as they could". The game lasts considerably longer than The Mole, The Mob and The Meatball did without compromising on the clever parodying the new series has become famous for. Episode 4 signifies a significant push in the right direction, leaving players already invested in the series optimistically anticipating the final two episodes and giving people watching cautiously from the outside reason to jump in and get their feet wet. 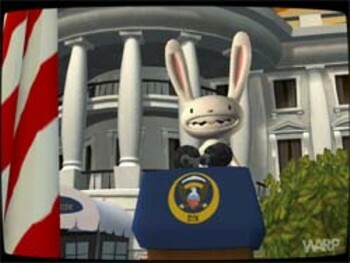 If you enjoyed this Sam & Max Episode 4 - Abe Lincoln Must Die review, you're encouraged to discuss it with the author and with other members of the site's community. If you don't already have an HonestGamers account, you can sign up for one in a snap. Thank you for reading! None of the material contained within this site may be reproduced in any conceivable fashion without permission from the author(s) of said material. This site is not sponsored or endorsed by Nintendo, Sega, Sony, Microsoft, or any other such party. 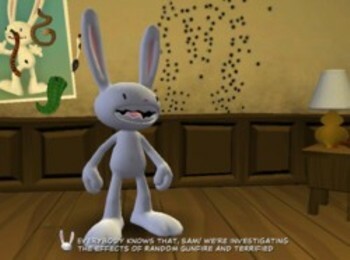 Sam & Max Episode 4 - Abe Lincoln Must Die is a registered trademark of its copyright holder. This site makes no claim to Sam & Max Episode 4 - Abe Lincoln Must Die, its characters, screenshots, artwork, music, or any intellectual property contained within. Opinions expressed on this site do not necessarily represent the opinion of site staff or sponsors. Staff and freelance reviews are typically written based on time spent with a retail review copy or review key for the game that is provided by its publisher.